"With TRIZ, you can ..."
a methodology for creative problem solving and innovation, and its related areas. promotion and application of TRIZ. also from all over the world, so as to make the Symposium an open conference. #To introduce TRIZ and make it to penetrate widely into people engaged in SMEs and at schools. #A Symposium primarily Japanese national and partially (but as much as possible) international. #To hold the General Assembly Meeting of Japan TRIZ Society within the Symposium period. 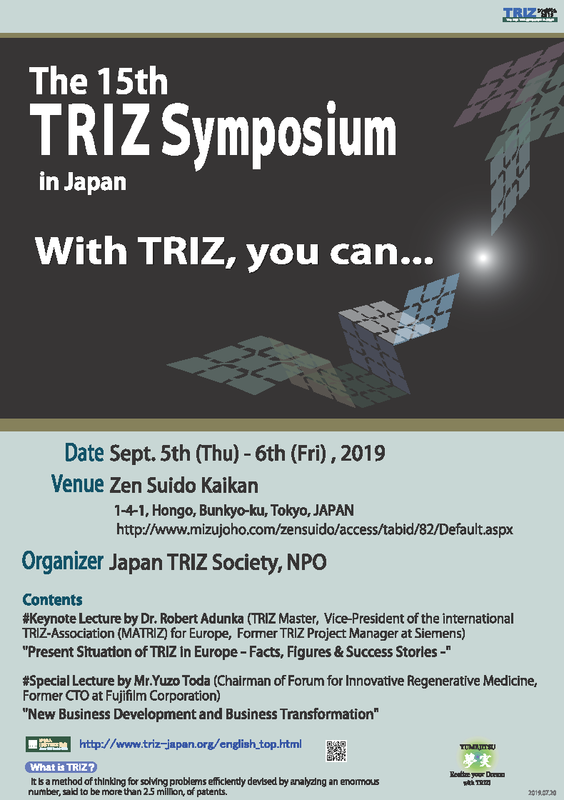 Call for Papers to "The 15th TRIZ Symposium in Japan, 2019"